Yesterday was a long, but productive, day as I met with almost all of my parents. I wanted to share the conference form I use that is pretty quick and easy to write. Several years ago, I used to write a paragraph about each child. It took so long to look at all of their assessments, then try to word a sweet, but direct, synopsis 18 different times. I decided there must be a quicker way. So, I created a checklist-style conference form. The skills closely relate to our lengthy report card. All of the "positives" are listed on one side and the "let's work on these" skills are listed on the other. Sometimes, I will put a checkmark on both sides (ex. If a child can count by 1s and 5s but not 10s, I will just circle the 1s and 5s on the "positive side" and then circle the 10s on the "negative side." ) I feel like it's a quick way for parents to see areas of praise and areas of concern. Here's a look at my checklist. I have downloaded it as a Word document, in hopes that you could change it to meet your needs. Click on the picture to download. Wow! This is EXACTLY what I need. My conferences will be coming up in early Dec and I've gone through just what you wrote about, writing little paragraphs about each child, spending hours upon hours preparing. Thank you so much for posting. This is great and will be so helpful. Do you give your report cards out at this conference as well? Yes, I give out the report card for the first nine weeks. I also share with the parents the reading and math assessments that were used to determine the grades. I use the conference form more for documentation purposes (because we are required to have conference forms in the child's cumulative folder). This is a GREAT idea - much more "parent-friendly" than the report cards. I think I'll make something like this up for my older kiddos. Thanks! Wow, I really like this. 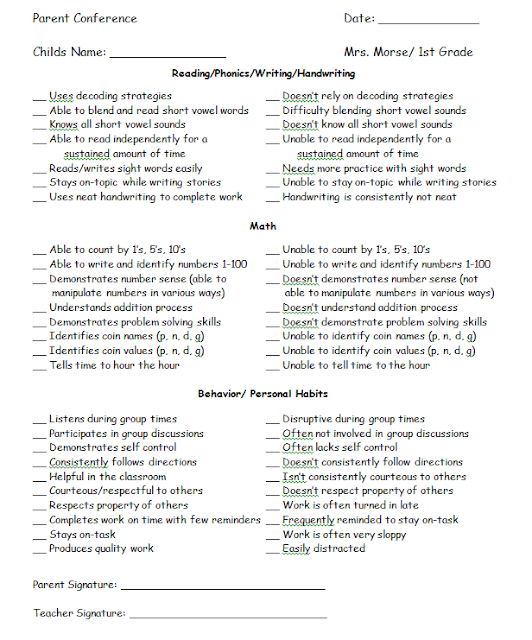 I have a conference form I like but I would love to include your behavior part and some of the language arts. I love blogging! It's so helpful to see what others do. Thanks for sharing. Wow! Thanks so much for sharing this. Our conferences are Thanksgiving week and I am definitely using this. Thanks so much. Conferences are coming up in two weeks! This is exactly what I needed. This form is great! Do you have ones for parent conferences later in the year? Thank you for sharing. This is what I need right now.